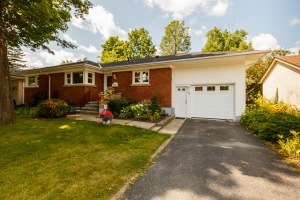 sitting on a beautifully landscaped lot resides this elegant, elevated brick/stucco bungalow that exudes character and charm with thoughtful updates in well sought after mowat woods. relax and let your cares go free on your deck surrounded by mature trees and beautiful gardens. main floor offers carpet free living with hardwood, laminate and slate flooring, updated kitchen with pantry, open concept living/dining with a beautiful wall glass built-in, stunning wood burning fireplace for those cold winter nights and 3 generous bedrooms with an updated full bath. on the lower level, pristine and massive unfinished basement, with rough-in for additional bath awaits your creativity for future expansion of recreational living. this home is truly a pleasure to show and move in ready, not to mention all the big ticket items are complete, shingles 13, gas furnace and central a/c 12.